I've not posted much for the last few weeks because I've be pretty much swamped by a number of projects at work and home, most of which have been completed this week. The two biggies were a huge safety report for work and completing the layout draft of Wordplay for Graham Spearing. The first project left me very proud of my team who had pulled out all the stops over the last 6 weeks to turn around a lot of detail whilst holding the fort for normal operations. 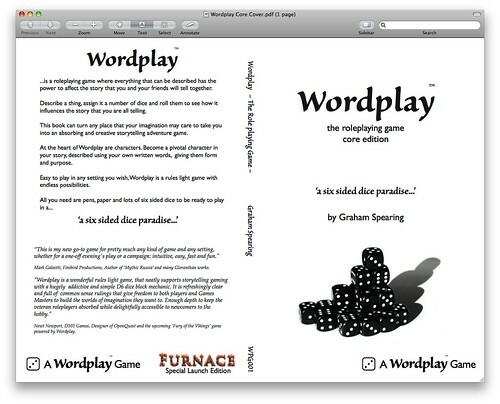 The cover of Wordplay screenshot in the Preview Window. Laying out Wordplay was a real personal challenge, as I've owned the Adobe InDesign package for about two years so far, but only really used it for one serious project (some posters and leaflets for the Church Refurbishment campaign). I offered to lay out Wordplay for Graham because it was a chance to learn how to use the package in more details – with an aim being to offer it for BITS – and also to help a friend produce a book of a game I've been really impressed with. It will be released in 2 weeks at the Furnace RPG convention in Sheffield, assuming Lulu delivers the goods on time to Graham. Although frustrating at times, I've learnt a lot that I don't want to loose. Plus I think the finished result looks good; however, I'll wait for the judgement of others once it starts getting purchased. So, the work project finished on Friday, and Wordplay was completed on Sunday. The rest of the weekend was the usual stuff, but brilliant all the same. Haircut in the morning first thing to get rid of the grey and reveal the ears, and then on to swimming with Nathan. He is being a little reluctant jumping in at the moment, but was doing fine by the end of the session. We headed back, only to find him fast asleep as we reached home. Jill headed off to the 'Auction of Promises' supporting the Church Refurbishment, and we came away with a week's holiday in the Lakes and a weekend in Filey. So that's some holidays sorted for next year. Once Nathan woke up, we went to Sainsburys to get supplies; we also managed to end up with quite a few new items of clothes for Nathan as he has got longer and leaner. We measured him recently, and he was 94cm tall, a jump of 7cm over three months. I've just upgraded my MacBook to OS X 10.6 Snow Leopard. So far, everything seems to have gone smoothly, but I'm writing this blog post as a tester, as Rapidweaver is still a beta release candidate rather than a final update. I'm going to wait a little longer with the iMac, maybe a week or so to let some more beta stuff become full releases. First impressions; it does feel a bit faster, and the Expose Integration into the dock is pretty good stuff. I do like Neil Ford's reference to the new OS as "Snow Kitty"; it's struck a note and that's how I mentally think of it now. There is a really good techie review of Snow Leopard at Ars Technica. On other techie news, the iMac is now using Time Machine (hooked to a Western Digital My Book External HDD connetced to the unused FW800 port) for standard back up, rather than Chronosync. The latter had started taking over 10 hours to do the nightly back up to the NAS which was getting silly. I'm going to use the NAS as an archive drive for installers and media instead. The SuperDuper boot drive clones will continue to be made every one to two weeks as the ultimate back up. Update: As the MacBook has been behaving so well, and the beta software has no issues visible, I took the plunge and ugraded to Snow Leopard on the iMac as well on Saturday night.